My FDX PSU appeared to be working - the DC voltages were slightly low, but should have been adequate to power the FDX. The system booted and the disk drives appeared to work normally, but there was a problem with the 80 Column card output, the display "shimmered" quite badly. Swapping the 80 Column card had no effect on the symptoms and further investigation revealed that the PSU's output voltages had large variations. Given the age of the PSU, rather than attempt further repairs, (I had already replaced a blown filter capacitor,) I decided that it would be better to replace it with a more powerful modern PSU. Peter Kretzschmar had already identified a possible replacement that would fit inside the FD case - a HEC-200SR ATX PSU. To access the FDX PSU, you need to almost completely dismantle the FDX, you might want to refer to my FDX disassembly page before you start. 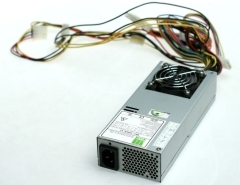 On this page, the starting point is assumed to be that you have removed the existing PSU and are ready to install a replacement. 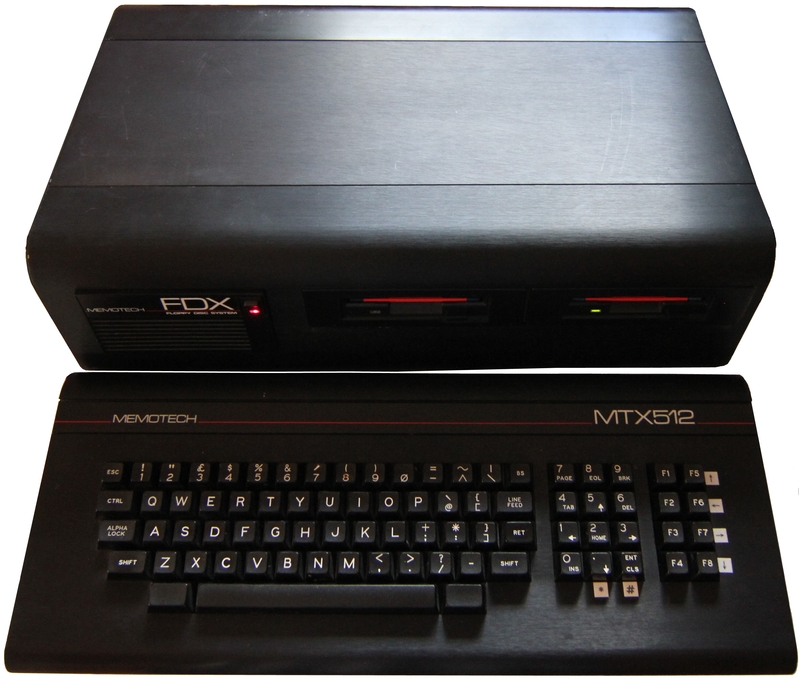 The FDX used an Astec AC8151-01 to provide power to the 6" PCB card frame and the floppy disk drive(s). The power distribution wiring inside the FDX is rather "interesting", so I needed to unscramble it to see how best to install the replacement PSU. 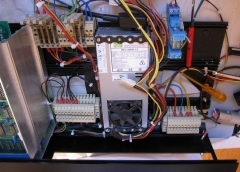 The illuminated DPST rocker switch on the FDX front panel supplies power to the input of an EMI/RFI suppression filter and the connections to the 240VAC case fan are tapped off the input connections to this filter. The output from the filter is split to feed the FDX Astec AC8151 PSU and the transformer which supplies MTX power. Initially, I was going to keep the existing fan and filter, and only replace the PSU, wiring it to the input side of the filter. However, since the ATX PSU had extra capacity available, I decided to replace the fan with a quieter DC fan and decided that I could remove the suppression filter. This had the benefit of making the replacement wiring simpler too. There are a number of options for mounting this ATX PSU inside the FDX, including fitting it inside the rear curved panel section, but this would probably require removal of the case fan and the internal PSU fan would likely not provide adequate cooling for the FDX card cage. 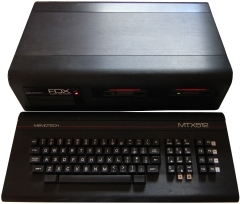 I chose to mount the PSU in pretty much the same place as the original FDX PSU, although it is somewhat longer than the original, the HEC-200SR can be fitted below the floppy disk plinth, mounted lengthwise, with the IEC-C13 power input at the rear, the DC output wires at the front and the PSU fan exhaust facing upwards. The length of the ATX PSU makes for a tight connection when using a standard IEC-C13 connector so I used a right angled connector rather than a straight one. Not wanting to butcher the FDX case too much, I looked for a way to secure the PSU with minimal damage, i.e., without drilling extra holes in the case etc. Although somewhat "industrial", I found that a really effective way of fixing the PSU was to use perforated steel banding like that shown. This could be formed around the PSU and fixed with self tapping screws into the channels in the FDX base. The ATX PSU fixed to the base of the case, at the rear, the securing strap is fixed to the rearmost preformed channel on the base. To allow more clearance for the power input connector at the rear, the front of the PSU is fixed to a channel in the bottom part of the front cover panel. This means that the front panel can no longer be removed until the front PSU fixings have been removed. This could be problematic if you plan on reusing 5.25" drives, but as I was going to upgrade the drives to 3.5", this was not a problem for me, however, for completeness, I did check, and while it is very tight, with care, it is possible to refit the plinth with 5.25" drives on it. 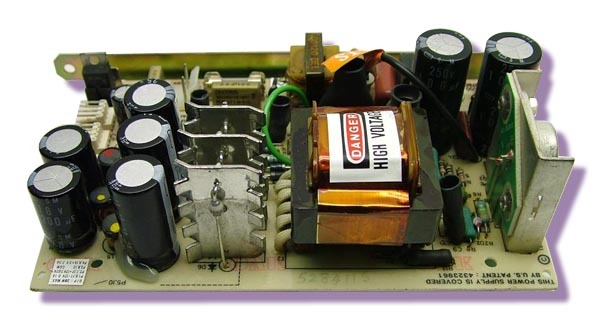 The output of the original PSU was rated at only 40W, requiring in an AC input current of up to 0.85A (rms) and the internal mains wiring was sized appropriately for that current draw, i.e., the wires were small, I would estimate them to be about 0.5mm2. 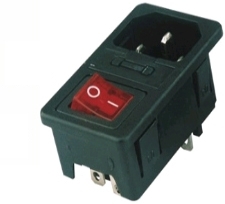 The fuse in the FDX power receptacle was a 1A "anti-surge". If the new PSU was only ever going to supply the original FDX devices, the wires would have been adequate, but since part of the reason for replacing the PSU was to be able to provide power for some potential FDX upgrades, then due consideration should be given to the size of the existing conductors and rating of the mains switch. Initially, since I was not going to increase the power consumption of the FDX, I was planning to re-use the original wiring and switch and leave the input fuse as 1A. As the "design" developed though, replacing the internal AC wiring did not require much additional effort so I upgraded the internal wiring to 1.0mm2 - this is fine for up to 10A, well in excess of anything that I am likely to need but consistent with the mains IEC mains connectors that were being used. To support the capacity of the PSU, I increased the FDX input fuse to 3.15A. 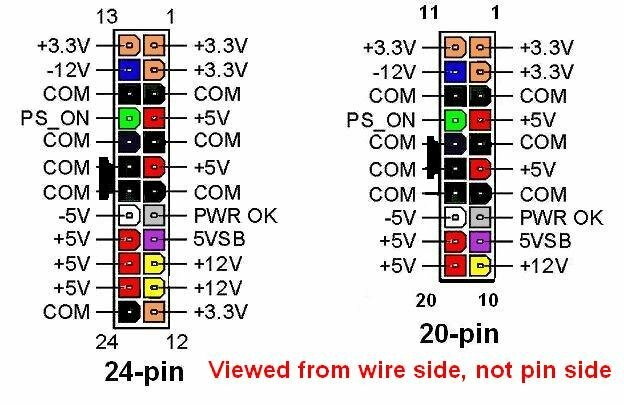 As the table shows, in order to use this power supply as a replacement for the one in the FDX, the green wire (Pin 14) must be shorted to ground to turn on the PSU, this is normally what the power switch on the PC does. It is highly unlikely that I would ever have needed to reuse this PSU in a PC, so I decided to use the 20 Pin connector to break out wires for the FDX card frame rather than wiring it into a Molex peripheral connector and insert a shorting link between pins 14 and 15 to have the PSU turn on when AC power is applied. The rest of the terminals in the connector were going to be left in place to make them available should they be required for future expansion. The Molex peripheral connectors were left unmodified for connection to the FDX disk drives. 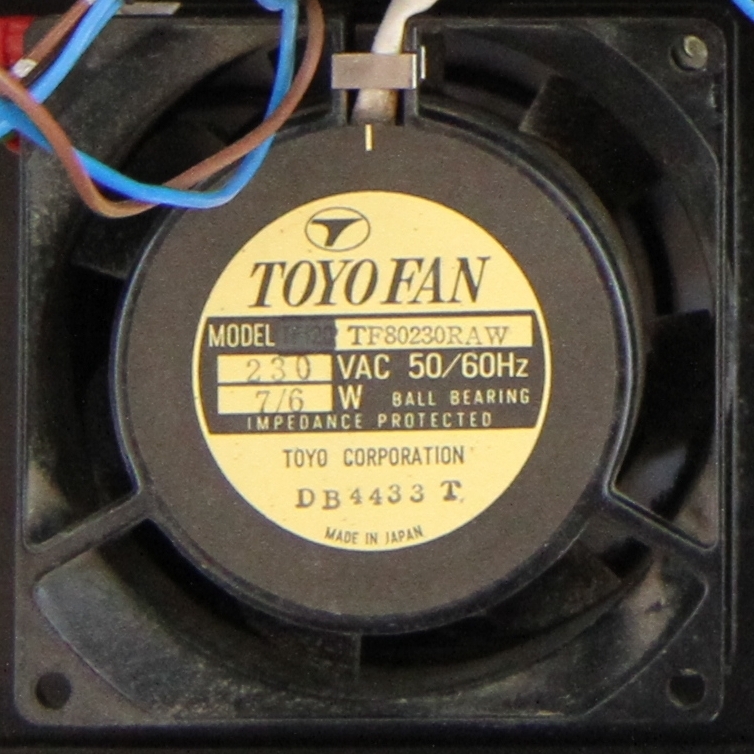 The original case fan was a Toyo fan, model number TF80230RAW, an 80mm, 230VAC unit. This fan is obsolete, but the RS Electronics website suggests a number of replacement tube axial fans, with flow rates in a range between 26-31 cubic feet per minute with a noise level of 28-36 dBA. Based on this data, I planned to fit the quietest DC fan the I could find with a similar air moving capacity . I selected a JF0825-00 Series fan, the JF0825S1L-00, it is a 12V model with a flow rate of 25.5 CFM and a noise rating of 22.2 dBA. The JF0825S1M-00 is rated at 32.5 CFM and 27.8 dBA but I went for low noise at the expense of some air moving ability. 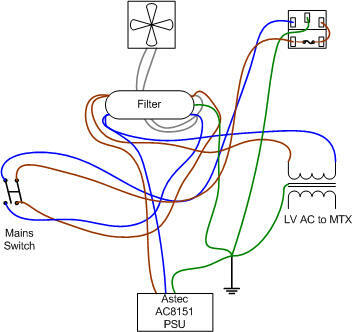 As shown in the earlier diagram, I had intended to reuse the original FDX power switch to switch mains power to the ATX PSU. I have now decided that it makes more sense to use the PSU in a similar way as in a PC, i.e., to have the facia switch turn on the PSU using the ATX PSU_ON signal. 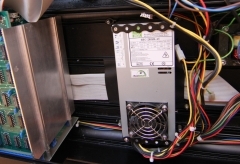 This would also allow me to dispense with the existing FDX internal AC wiring, but I also think that it would probably be better to retain a main power switch as is typically used on larger PC PSUs and replace the IEC male socket on the rear of the FDX with one with an integral switch such as this. This is a "future enhancement" and has not been done at this time, mainly because I'd need to enlarge the mains inlet cut-out in the rear panel . As the facia switch would now only control the output from the ATX PSU, this would mean that the transformer supplying low voltage AC to the MTX would remain powered on when the FDX power lead was live and the ATX PSU was on stand-by. This was obviously undesirable, so I decided to install a relay which would only pass power to the MTX transformer when the ATX PSU was switched on. 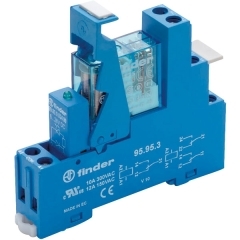 This relay from Rapid On-Line can be switched by 9 to 21VDC and will be fed from the 12VDC output from the ATX PSU, the relay will then only allow 240VAC to pass to the MTX transformer when the ATX PSU is on. I have found that the same transformer used in the MTX PSU can get very hot during extended periods of use and I didn't want to risk accidentally leaving the FDX transformer power on for extended periods if I hadn't unplugged the FDX. Of course other, smaller, relays would have been suitable, but I am happy with this one. Mark suggested that it would be a good idea to fuse the DC outputs from the ATX PSU - particularly as this PSU was capable of delivering far more power than the standard FDX supply, which seemed sensible. My "simple" power supply replacement project seems to be growing beyond all recognition - probably a function of having too much time on my hands and enjoying "playing"! The easiest way of fusing the DC power would have just been to add some in-line fuse holders, but since the relay for the MTX transformer was going to be DIN rail mounted and I had spare rail, as well as DIN rail terminals and fuse holders, I decided to go overboard and do the whole lot this way. The end result is that the inside of my FDX now looks more like an industrial control panel than a vintage computer! 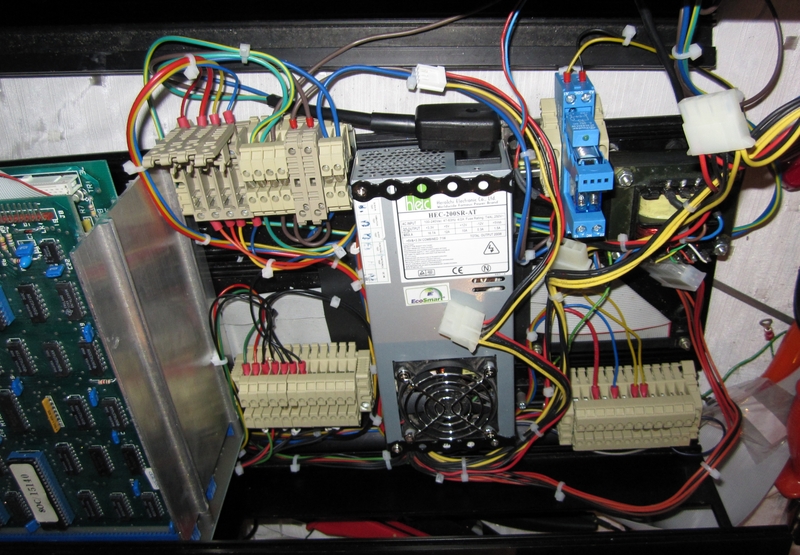 Note: If you are just replacing the FDX PSU functionality, then the additional wiring shown above is totally unnecessary, but it does make it easier to support future additional power requirements. It was only as I got towards the end of doing the wiring that I realised that to make replacement of the ATX PSU easier, should it fail in future, I should have kept the standard ATX power plug unmodified and made my connections to a suitable mating connector. Doing it as I have, will require remaking the PSU terminations individually should the PSU fail. If I replace the PSU in my other FDX, or this PSU fails in the future, I will make this change. 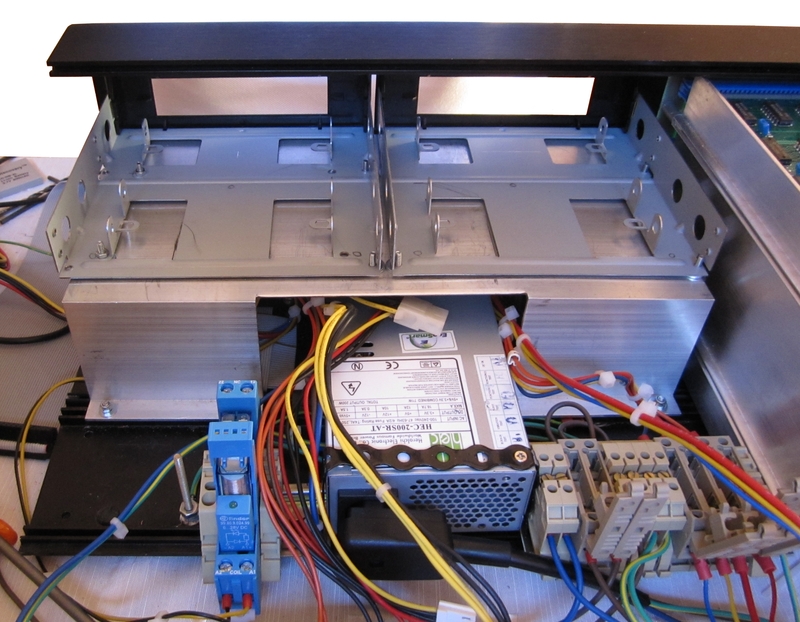 It is possible - just, to install the disk drive plinth with the MTX transformer in place, but it is much easier if the transformer is removed. The most awkward task is mating the holes in the front edge of the drive plinth with the hex headed bolts that are held captive in the channel in the front panel. With the transformer in place, there is much less room to manoeuvre the plinth to mate it with the bolts. 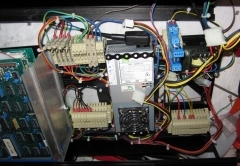 Now is a good time to check all the wiring, terminations and power supply outputs, since most of the DC distribution is not accessible after the drive plinth has been installed. 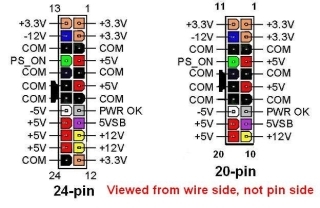 When doing my checks, I was surprised to find that I had a low resistance between the +12V and 0V lines, this had me more than a little worried until I remembered that this FDX has a 39 ohm resistor between +12V and ground - probably to generate a minimum current draw for the Astec PSU. The Astec specification document lists the minimum 12V load as 0.3A, this is consistent with the resistor value: 12V / 39R = 0.30A. 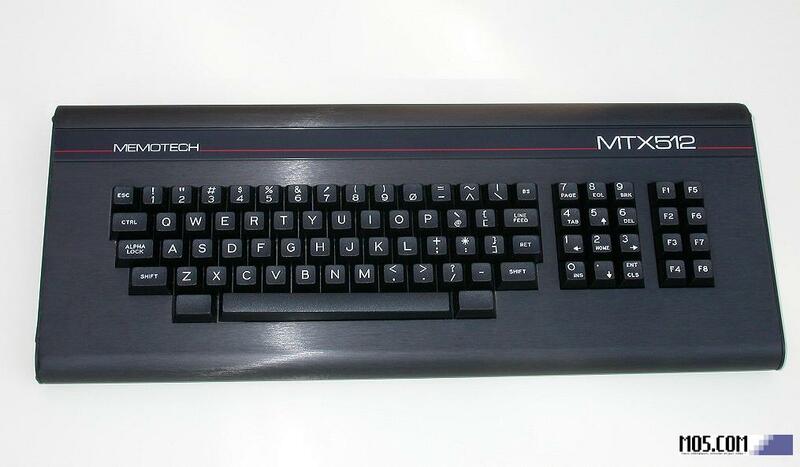 The MTX transformer and the front grill panel can now be refitted and that is just about it . . . .
Reconnect the floppy drive cable to the disk controller and connect the data cable and power cables to the floppy drives. Slide the top cover back in place and reinstall the second end-plate. You can see the new style power switch and the replacement 3.5" disk drives though - and even something happening on drive "C"! (It's "PIP"ing the contents of a CP/M System disk from Drive "B"). At this point, the FDX is working fine with the new PSU and, having replaced the 5.25" drives with 3.5", is actually using less power than before. I just need to find some suitable upgrades to take advantage of the extra power now available!